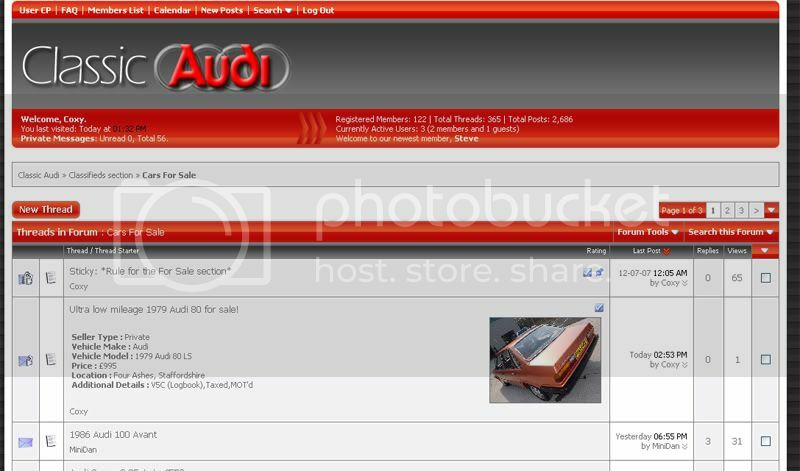 PLEASE NOTE - You must be either an approved and paid up trader or a Classic Audi member to be able to post in the Classifieds sales sections on Classic Audi. Please don't abuse your privileges! TRADERS - There are a few people who come on here posting for sale threads on a semi regular basis. I have no problem with this as long as you abide by some rules. If you want to use Classic-Audi to help run your business (and yes, if you have Classic Audi parts for sale, then advertising here is getting straight to your target audience! ), then you'll need to give a little back first. Do not get offended if you find your thread is moved if you are regularly posting without putting something in to the pot. We will offer good rates as we want people to be able to keep their cars on the road! Think of it as paying your Landlord rent to avoid eviction! This will allow you to advertise as many times as you wish in the Classifieds sections. 3) Traders may advertise on this forum at a cost of £10.00 per advert or £20.00 per advert if Non Audi. Posts may be removed at the Moderators and Owners discretion and an explanation PM should be passed on. and here's a guide to help you use the for sale section! Overview: The following tutorial is a step by step guide on using the new 'Vehicles For Sale' post template. If you click on the 'New Post' icon you will see that the entry for for the post now contains extra fields compared to the other 'New Post' pages. This has been designed to format the Vehicles For Sale adverts better and to provide more information to the buyers. The new fields have brief descriptions on what is required just below the titles and are detailed below. Some of the fields have a red asterix to the right of them. These indicate that it is a required field and MUST be filled out. Please do not just put junk in there so that thery contain data. If this is the case then either you will be asked to fill out the infomation correctly or the advert will be removed without notice. Seller Type - This option button is used to distinguish between the type of seller. If you are a trader then please use the trader options as we will keep an eye on this. Vehicle Make - Simply is this an Audi or not. Select the option button as applicable. Model - If the vehicle has a specific model name (Or the vehicle is not an Audi then manufacturer also) then enter as much information in here as you can to give the potential buyers an idea of what you're selling. Price - Something that we all like to know so please enter the price you are advertising in here. **Note, the £ sign should not be entered. You can enter "ono" after the price if needed. Location - To save you getting a ton of "Where are you" posts instead of genuine interest, please enter the location of the vehicle. It should NOT contain a full address but details such as your local town\city will help people looking to find out if the journey is within their limits. Additional - Just a few simple check boxes which will answer most peoples initial questions, Does the vehicle have a V5c (Logbook), Tax and\or MOT. Just tick the ones that apply. 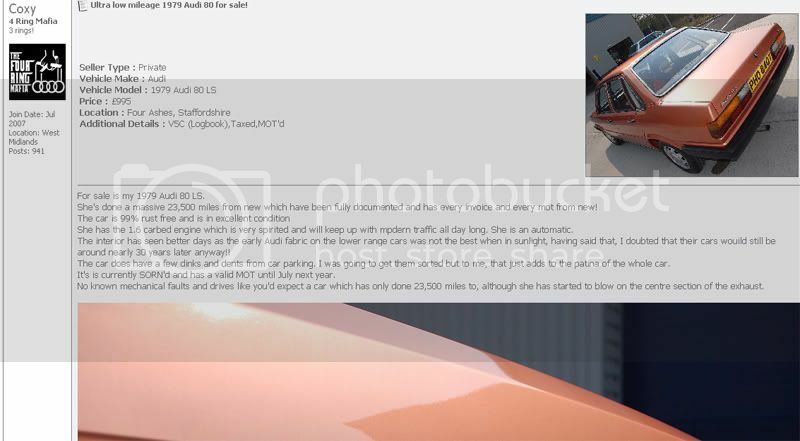 Photo URL - Here you can include the URL for a picture of your vehicle that will display in both the forum listing and thread display of your advert. Simply type or paste the URL for your image in the text box. The image will be automatically resized to fit in with the proportions of the forum display. 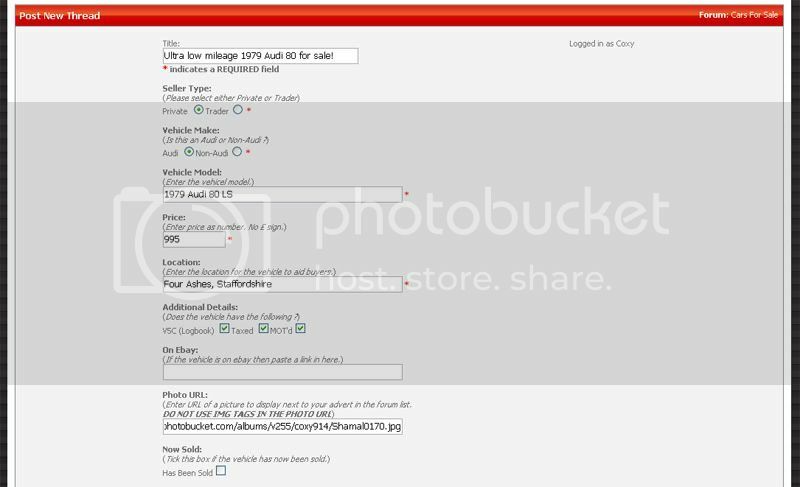 Make sure that your URL for the image does not contain any [IMG] tags. Now Sold - If your vehicle has now been sold then please tick this box. It will display that the vehicle has been sold in the thread title so should stop you getting any more unwanted questions. Once you have filled out the above fields you can carry on with filling out the standard message box with the full details of your advert. Please note, adverts that are just a link to other forums or Ebay with no details on Volkstorque may be removed without notification. Remember, you're selling it for a reason so give as much information as possible and try to sell your vehicle. Once you've submitted your advert it will take you into the thread. Below is an example of what an advert will look like in thread view ..